Tara loves gym and spends every spare moment practising in her garden. When she joins the Silverdale Gym Club, Tara's catapulted into their star team. But with so many new things to learn - like backflips, somersaults and handsprings, how will Tara ever catch up with her talented teammates? With a foreword by Olympic medal winner Beth Tweddle. Jane Lawes studied American Literature and Creative Writing at the University of East Anglia and started a PCGE in primary education, before deciding that her real passion lay in books. She currently works in publishing by day, and as an author by night and at the weekends. 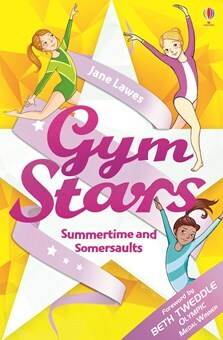 Gym Stars: Summertime & Somersaults is Jane’s first novel. Visit www.janelawes.co.uk to find out more. Tara yawned and stretched, then smiled when she remembered she didn’t have to get up yet. It was the first day of the summer holidays. She thought about all the fun things she was going to do with her friends. She was most excited about her eleventh birthday in a couple of weeks, and the party she was having to celebrate. The sun was already streaming brightly through a gap in her pale blue curtains and she was too hot under the bedcovers. It was going to be a beautiful day – perfect for practising gymnastics in the garden. Tara loved gym. A year and a half ago, when she was in Year Five at school, her class had learned to do handstands and cartwheels in their PE lessons. As soon as she kicked her legs up into her first wobbly handstand, she was hooked. She’d always loved watching gymnastics on TV, but actually doing it was even better. So she spent every spare moment practising – out in the garden at weekends, in the living room or her bedroom if it was raining. Now she had the whole summer holidays stretching out before her and she was going to use every single day to work on her skills. She closed her eyes, listening to the birds outside, and thought about all the things she was going to learn. A backward walkover was top of her list. She was nearly there, so close that sometimes when she was practising she felt like she was sure to manage it if she just tried once more. There were so many other things she wanted to learn too – like backflips and somersaults – but she knew she wouldn’t achieve them all this summer. Everything in gymnastics took a long time and a lot of work. She threw back the covers, suddenly wanting to get started right away. Downstairs, her six-year-old sister Anna was already up and watching cartoons, with a half-eaten bowl of cereal on her lap. Dad had gone to work and Mum was nowhere to be seen. She was probably enjoying the first day of not having to take Tara and Anna to school. “Morning,” said Tara, helping herself to some cereal. Anna mumbled something, but Tara couldn’t hear what it was because Anna had her spoon in her mouth. Tara ate her breakfast, washed it down with juice, and then ran back upstairs to get dressed. A T-shirt and shorts were all she needed for practising gym, so she was soon running back down the stairs, pulling her blonde hair up into a messy ponytail as she went. The garden was sunny and warm. She was glad to feel a little breeze on her arms and face – gymnastics was hard work and it was even tougher when it was boiling hot outside. Tara’s garden was quite big. A rectangle of grass took up most of the space, which was brilliant for practising floor routines and taking a run-up for round-offs and handsprings. There were flower beds around three sides, and the fourth side, nearest the house, had a little concrete patio they used for barbecues. She did a quick warm-up in the middle of the garden. Warming up was really important; they were always told that in PE at school. She definitely didn’t want to pull any muscles – the idea of an injury stopping her from practising all summer was too horrible to think about! Secretly, Tara also liked warming up properly because it made her feel like a serious gymnast. Real gymnasts like Beth Tweddle and Shawn Johnson had to warm up well because they did such difficult things, and Tara wanted to be just like them. She swung her arms around in big circles and stretched her leg muscles by lunging forward, and to the side. Then she bent to touch her toes and, keeping her legs straight, put her hands flat on the floor, feeling the stretch down the back of her legs. With her warm-up done, she got started on the day’s work. She practised easy things first, as a kind of extension of the warm-up. Cartwheels and round-offs; bridges and handstands and splits. These were all things she’d learned to do last summer. When she was in Year Five, there had been a girl in the year above who did gymnastics at a club outside school, and she’d shown Tara how to do some of these moves. They came naturally to her now. The more tricky ones came next. These were mostly things she’d seen the older girl doing and had taught herself later, when she was able to do the basics. She practised moving from a handstand into a bridge position, and then pushed her hands off the floor so that she stood up. It had taken her every weekend of the summer term to learn that and she was very proud of it. She stood in the middle of the garden, wishing that today might be the day she did her first backward walkover. She was already part of the way there. She could stand with her feet apart and bend over backwards into a bridge. Then she kicked her legs over so that she was standing again. It had taken her ages and ages to manage that last bit. She’d started by doing it with her feet up on the sofa or her bed, and when she could do that she’d used a sturdy box that Anna stood on to see into the bathroom mirror when she brushed her teeth. Anna called it the Grow-Tall-Step, and she’d cried when Tara left it outside overnight. That was when Tara decided it was time to try kicking over just from the ground. It was hard. It had taken days and days of aching wrists, a sore back and disappointed hopes. But she’d got there. Now she could do it, easy-peasy, and that made all the work feel worthwhile. It was time she moved on to real walkovers. She stood with one foot pointed out in front of her and her arms stretched up. She bent backwards smoothly, raising her leg as she went so that she ended up in a bridge with one leg pointing up to the clear blue sky. She pushed hard with the foot that was still on the ground, but she couldn’t do it – she couldn’t kick her leg over to standing position. Instead, her feet landed back in a bridge. She let her body slump to the ground. For a moment, she lay on her back, one hand shielding her eyes from the bright sun. “Come on, Tara,” she whispered. “You didn’t expect to do it first time, did you? Try again.” She rolled over and got to her feet. Sometimes it was tempting to give up. But then she’d remember gymnasts she’d seen on TV, and the things the girl at school had been able to do, and she kept trying. She wanted to be like those gymnasts more than anything in the world. She gave the backward walkover another try. The same thing happened. Again. And again. And again. It was hard but she knew this was how gymnastics worked. All of this would be worth it when she finally managed to do a real walkover. Lunch? Tara was shocked. Was it really lunchtime already? She’d been so focused she hadn’t noticed the sun travelling across the sky, or the day getting hotter. “Mu-um,” Tara said slowly, while she ate her sandwich. “Please?” begged Tara. She’d been pestering Mum and Dad for ages now, and Mum knew that Tara had already gone on the internet and looked up all about the local clubs. The real problem, Tara knew, was that Mum was worried she’d get bored of gymnastics. But there was no chance of that! She just had to make her parents see that. In the afternoon, Tara pretended that the soft green grass was the blue square of a gymnastics floor area. She danced and jumped and twirled, scattering her favourite skills through the routine as she went. She was imagining elegant music in her head, with a good rhythm for tumbling. She couldn’t do any really good tumbling runs yet, not like the gymnasts she saw on TV – they all did backflips and somersaults with loads of twists and turns. But Tara still managed to put together a few tumbling sequences – on diagonal lines across the floor, just like world-class gymnasts did – with round-offs, one-handed cartwheels and her best skill of all: a handspring. She’d only just learned to do those, and she still needed a bit of a run-up, so she put one right at the end of her routine. A couple more run-throughs and she was ready to perform. She stood in one corner of her floor area. In her mind, her T-shirt and shorts became a gorgeous blue and black leotard, and all around the flower beds, the crowd were waiting for her to compete. She stepped forward, and raised her arms to present herself to the judges by the washing line. Then she took up her starting position, and the music swelled around her as she began the routine. She danced expressively, she finished every move as neatly as possible; she jumped and balanced and pretended that she was Beth Tweddle, one of her favourite gymnasts. Tara was nearing the end of her routine and it was time for the handspring. She took a deep breath, pointed her foot and ran diagonally across the floor. She launched herself forwards onto her hands and sprang over onto her feet. She landed in a squat position, which wasn’t how it was supposed to be, but it was the best she could do so far. She stretched, did a few more turns and leaps, and finished the routine with a graceful pose. Her imaginary crowd went wild, and she was just wondering what her score would be when she realized that the clapping was real. “Good job, Tara!” said Dad. Tara went red. She hadn’t noticed that she’d actually had a proper audience! Later that evening, Tara lay on her bed and watched the World Championships from last year, which she’d recorded when it was on TV. She’d watched it a hundred times since then, maybe more, and she knew all the gymnasts’ routines by heart. Her favourite routines were the ones on the floor. Would she ever get a chance to do those things? Some things were easy enough to practise in the garden, but she’d need big, squashy safety mats to try anything really difficult. Even if she had mats, she didn’t have anyone to show her how to do the moves. Would she ever know what it felt like to twist through the air in a somersault? No chance, she thought. She sighed, and rewound her favourite floor routine again. She imitated some of the gymnast’s graceful arm movements while she lay on her bed. Even if she did nothing else all summer, she would show Mum and Dad that gymnastics was not just a passing phase. It was the only thing she ever wanted to do. Olympic medallist Beth Tweddle’s endorsement will draw readers to this story of Tara, a talented young gymnast whose dreams seem to have come true when she joins a new gym club. This cheering 10/10 had me in happy tears at several points. My daughter, age 7, is keen on gymnastics and trains hard. She has recently joined our local gymnastics club. She also enjoys reading. This book was more of a success than I had imagined possible, in that it has both helped her gymnastics and provided her with an increased enjoyment of fiction. The only disappointment for her, was when she reached the end of the book. I've just ordered the next two volumes for her (this being 1 of 3) but I have no idea what I'll do once she's finished reading them too. Download and read the Gym Stars foreword from World and European Champion Gymnast, Beth Tweddle.